Cupcakes 'n Daisies: In a Bind....er . . . . . . I maintain four binders, and keep them right there on the top shelf in my sewing room. 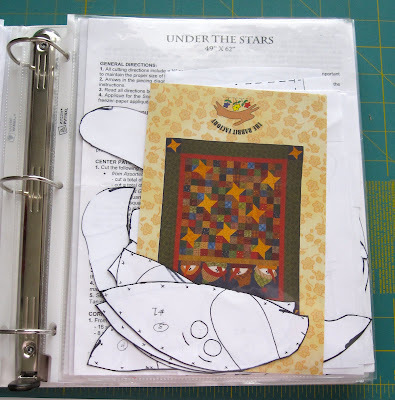 I have a pattern binder ( Favorites), a general quilting binder (Thelma's Very Special Quilt Binder), a finished projects binder (Patterns) , and the top ten patterns binder (I Can I Will Dream Big). Everything you need to create a binder system of your very own is at your local office supply store. The Favorites binder, the one that holds most of my patterns, is a 3 inch binder. I like to get the binders that have the clear plastic cover so I can decorate them up. Inside I open up the patterns to reduce bulk and store them in a plastic sheet protector. The big binder has two patterns per sheet holder, so I as page through the binder, I have the pattern pictures on both sides. At first I kept my finished projects in with the unfinished projects, but it seemed like I was looking for them all the time, having them together has been a real time saver. Plus, I needed the extra space in the unfinished binder. 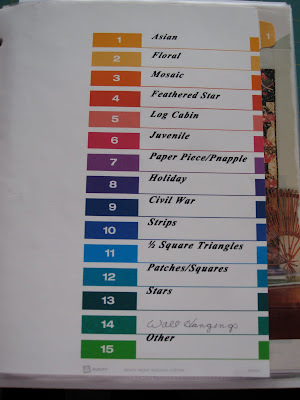 I also use these handy dividers, here's how the patterns are categorized... #13 has the most patterns....I seem to just love star patterns. I didn't realize it until I sorted my patterns and noticed the huge stack of the ones with stars. Blocks - for clever block ideas. Sometimes I like a certain block but not the whole quilt. Bindings/Borders - pretty self explanatory - I have handouts from classes on binding and pictures I've cut out of magazines of borders I like. Backing - Sometimes I see a quilt top that I think would make a good quilt back..or other clever ideas for the backs of my quilts. Quilting - Even though I don't quilt my own tops (yet) if I see a quilting pattern that I like I store it here, that way I can pass it along to my quilter. It's so much easier to show her what I want instead of trying to describe it. Craft and Gifts - this is where I store my Tuffet patterns, and other clever gifts ideas I see. Great Ideas - these aren't my great ideas, these are ideas that I read about and then think, "Clever, I should have thought of that", but would forget if I didn't store them here. Shopping and Web Sites - this is where I file the latest flyer from my LQSs, the business cards I pick up at quilt shows, and links to my favorite shops online. Misc - this is for the things that don't fit into any of the other categories, I have some newspaper clippings of some of my quilts and some notes from quilting friends that are special to me. When I get new patterns or pull something out of a magazine for my binders, I throw it in a filing basket and then when I get a few things in the basket I just file everything at once. Well that's it, it's a system that started with one binder and grew as my needs changed. I hope my organizational system helps you with your sewing room! is the makings of a cupcake! They have the applique glue already attached. So all I have to do is peel away the paper and press....I thought I would start putting these on the back corner of my quilts... then add my name and date. I bought the cupcakes from the Quiltin' Cousins booth and they are by Morning Glory Productions. Thanks for stopping by, it's a cold winter day here, perfect sewing weather. You are so organized!! 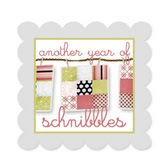 I love the little cupcakes - what a great idea to make them a part of your quilt signature! Great binder system, Thelma! When I get some time (huh! ), I need to organize my patterns and magazines - they are just everywhere - and may borrow a few of your organizational ideas. I like the cupcakes too, and a great way for you to sign off your quilts. I love your system. Much more organized then mine lol. Those cupcakes will make an awesome label! Thank you, thank you, thank you for dedicating this post to your binder system. Your instructions are fabulous. I'm going to get going on this today. You're the best, Thelma! I will definitely plan on using this brilliant method of yours for storing patterns! It will make it a pleasure to go look for something. Gosh I wish we lived closer! You are so organized! I love this...I am "borrowing" your idea. Those cupcakes are the cutest! I love, love, love your binders - perfect! Yes, I have quite a few binders with different categories, etc but they are BORING!!! LOL Yours are wonderful. Maybe if I would get myself organized I wouldn't buy patterns that I already have. Could you send me the name of the cupcakes? Great system...and so pretty too. Mine are organized in files, handy but not nearly so fun to look through as yours. Thanks for the ideas! You have inspired me! I'm going to tear in to my patterns and gather up the loose ones and get organized! I have most of mine in binders now, but they sure aren't organized like yours. When I'm looking for a pattern I have to go through 4 binders to try and find it. Love the cupcakes! I saw your quilt with the snowmen heads at a quilt show and I was hooked. I have to try and make one. Your quilts are beautiful and definately the most beautiful of all the quilts displayed at the show. What is the pattern for the snowmen head quilt. The snowman pattern is Quilt # 40, Under the Stars by The Rabbit Factory. For more detail look under Categories on right side of blog. Thank you so much for the lovely compliments on my quilts. OMG this is so you. Good organization system!!! The cupcake quilt will be just darling; can't wait to see it. You are very organized!!! When I see a pattern I like I usually try to buy it since you never know if you will see it again! I should follow your example since sometimes I forget what I have! Those cupcakes are darling!!! Great idea to put them on the back of your quilts. Great binder organizational plan. Thanks for sharing your method. What a great, great system. It is just amazing. Love those little cupcakes...just perfect for your label! Thank you, Thelma for the information and inspiration for the Under the Stars pattern from The Rabbit Factory. I just ordered it on line. Look forward to your blogs everyday. Thanks for sharing. Thelma, you've got creativity and organization mastered -- and they're two characteristics that are often mutually exclusive in a person! Like Nicole said: I wish we lived closer! The cupcake labels are very cute! I am a pattern collector too! 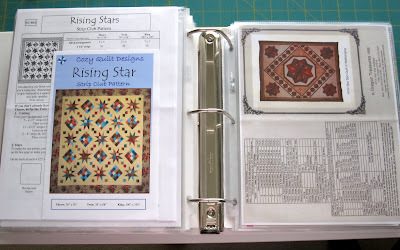 I love your binder system - I have a similar system for patterns and tutorials printed from the internet but I think I might expand it to purchased patterns - great idea! 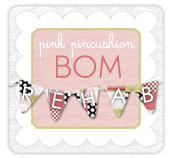 Love your blog - I just found it via Nicole's blog.